Yamaha’s new YAS-107 soundbar offers several refinements from its predecessor, the YAS-106, and therefore takes its place as our top recommendation in the budget price class. On the outside, the YAS-107 sports a sleeker shape than its predecessor. On the inside, there are two 1-inch dome tweeters, two 2-1/8-inch midrange drivers, and two 3-inch cone subwoofers in a dual-ported design. 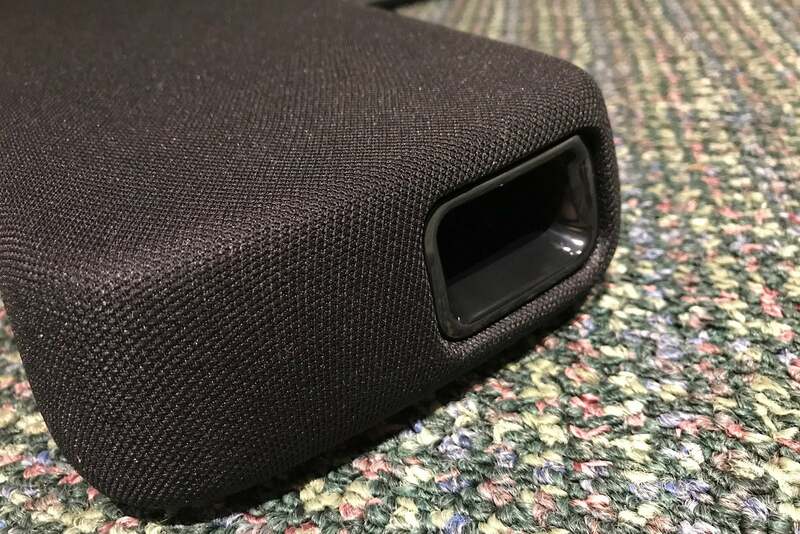 There’s a bass port on each end of the soundbar. A 30-watt amplifier is dedicated to the front-left and -right drivers, while a 60-watt amplifier handles the bass drivers. While the configuration might look the same as the YAS-106, Yamaha told me it offers several improvements over the previous generation. The drivers are a new design, as is the amp. The internal cabinet has also been redesigned. Yamaha says that these incremental improvements contributed to the YAS-107’s improved midrange and clearer dialog. You can wall-mount the 7.1-pound YAS-107 via keyhole slots on the soundbar’s rear, or lay it flat on a table or countertop. 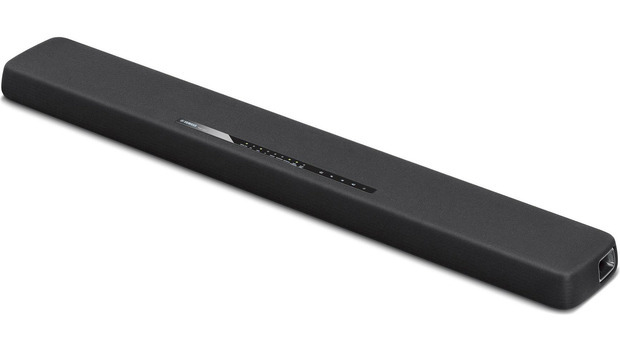 Included foam bumpers help prevent the soundbar from scratching your wall or table-top surface. Wall mounting hardware is not included. The YAS-107 doesn’t come with a subwoofer, but it does provide a subwoofer output so that you can add wired model later. Personally speaking, I’d much rather have the flexibility of adding a quality subwoofer of my choosing as opposed to being stuck permanently with one that came with a soundbar. 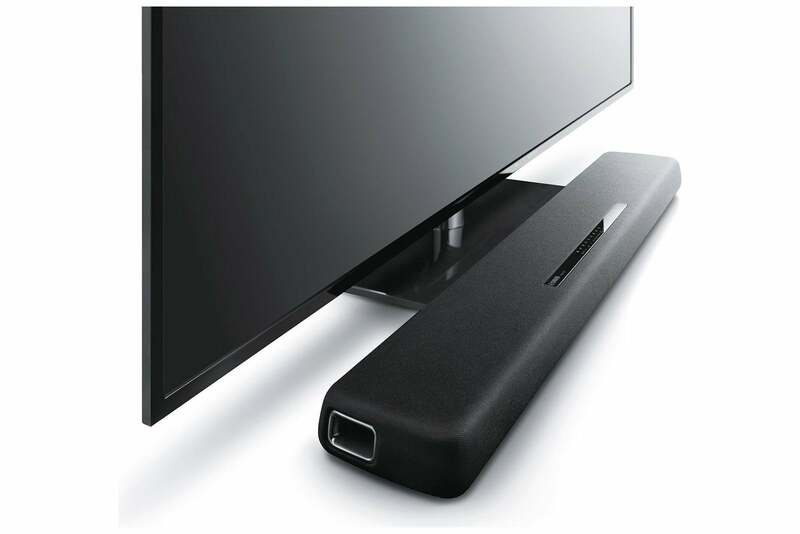 Yamaha’s YAS-107 soundbar can be wall mounted or set on a table as shown above. The YAS-107 includes some of today’s latest HDMI technologies and gives you the flexibility to set up your entertainment room as you see fit. 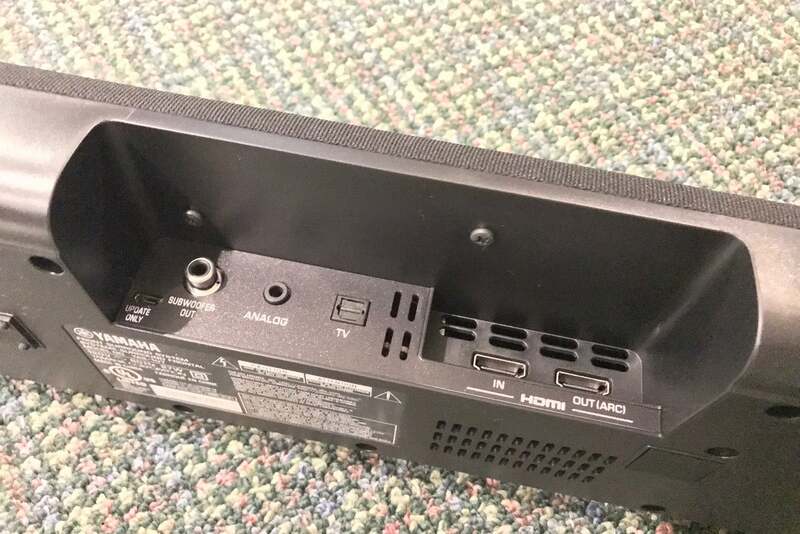 There’s a single HDMI 2.0a input with HDCP 2.2. That means you can connect 4K UHD sources to the soundbar and then pass that signal to your TV to take advantage of high dynamic range (HDR-10, but not Dolby Vision) and BT.2020 expanded color gamut found on today’s 4K UltraHD Blu-ray and 4K UHD streaming sources. Why is this important for an audio device? Well, as I mentioned above, the YAS-107 gives you the ability to connect a 4K UHD source directly to the soundbar and it will video through to the TV. The HDMI 2.0a output also supports the Audio Return Channel (ARC), which will send audio to the soundbar from your TV. This is useful when you're using the TV's onboard tuner or any of its media-streaming apps. You’ll need to make sure that your TV supports this feature for it to work, but it's relatively common these days. View of the Yamaha’s inputs, which sit in a recessed cavity on the back. Other audio inputs include a Toslink optical digital and 3.5mm analog stereo input. The former allows you to feed audio from your TV to the soundbar if your TV doesn’t support ARC. You can use the latter to feed audio from gaming consoles or use the analog output from other source devices. If you’re connecting a 4K UHD source directly to the Yamaha YAS-107, as opposed to your 4K UHD TV, you’ll find this bit of information significant. Yamaha has improved the YAS-107’s color support. For those of you who like to geek out on the details, the YAS supports 4:4:4 as opposed to the 4:2:0 the YAS-106 supported. This can be an important detail if you’ll be serving up 4K UHD content with expanded color gamut. You can learn more about the differences between 4:4:4 and 4:2:0 chroma subsampling from this video overview. Yamaha informed me that the YAS-107 will be among the first soundbars to add DTS Virtual:X. DTS Virtual:X is a technology that uses digital signal processing and psychoacoustic techniques to simulate an object-oriented audio experience in which sounds have height characteristics, even though there are no height or rear surround speakers available. DTS says DTS Virtual:X will up-mix any source signal from two-channel stereo to 7.1.4 channels. You can read more about object-oriented soundtracks in this story. The firmware update should be available by the time you read this review. Current owners of the YAS-107 can download the DTS Virtual:X firmware update from here for free. Unfortunately, this firmware update was not available for me to test during the review window. Control the soundbar how you want. You can control Yamaha’s YAS-107 in one of three ways: with the included remote, with your TV’s remote, or via the Yamaha’s Home Theater Controller app on your smartphone or tablet. Detail view of the YAS-107’s bass reflex port. The included remote is excellent. Buttons and their functional text and icons are large, making it a good remote for older consumers. It’s not backlit, but the input and power buttons are a different color making them easy to identify. The remote is close to full-sized, unlike some of the other soundbars at this price point that include horrible, credit-card sized remotes with poorly laid out buttons. If your TV supports HDMI CEC and you connect the soundbar to the TV via HDMI, you can use your TV’s remote to control for basic controls, such as power and volume. Finally, Yamaha’s Home Theater Controller app connects over Bluetooth and provides you with full control over the YAS-107’s features, such as input selection, surround mode, and sound adjustments with real-time feedback. The app won’t allow you to include YAS-107 in a multi-room audio system, however; you’ll need to step up to Yamaha soundbars that support MusicCast for that. The Home Theater Controller app is cleanly designed and easy to use. Most soundbars at this budget price-point forego any app control, which may well be a deciding factor for some consumers. The app was my favorite control method of the three, because of the real-time feedback feature. Otherwise, you cannot readily tell how the Yamaha is configured. The Yamaha YAS-107 includes a basic remote, Toslink digital audio cable, and bumpers. I set up the YAS-107 soundbar on a table, which left the speaker facing up. Unfortunately, you can’t see any of its status feedback lights when the speaker is positioned that way—you can only see them when the soundbar is wall-mounted. My comments about the Yamaha’s status lights remain unchanged from my YAS-106 review. I used different source material but my comments below will focus on Star Wars: Rogue One, which I played from an Oppo UDP-203 4K UltraHD Blu-ray player. Put simply, the Yamaha YAS-107 is an outstanding soundbar—especially if your goal is improving dialog intelligibility. It didn’t matter which scene I was watching. dialog was always clean and crisp—and that was without Yamaha’s Clear Voice dialog-enhancement technology enabled. Enabling Yamaha’s Clear Voice, which is designed to boost dialog, did just that. It made the vocal range louder, but negatively affected the tonal balance of the system. Ruling out severe room acoustical anomalies, my hunch is that many consumers will find the YAS-107 good enough to use without needing Clear Voice. It’s there should you need it. Movies and TV programming are far more than just dialog, aren’t they? In that arena, the YAS-107 will satisfy your ears and your senses. The YAS-107’s dynamics and bass response were very good—especially considering the absence of an external subwoofer. Explosions in Rogue One Chapter 15 “Holy City Ambush” had punch. Blaster fire between Sol Guerra’s rebels and Imperial forces didn’t sound overly compressed or muted. Of course, if you really want to rock the house, you’ll want to add a subwoofer. Sure, you can increase the internal subwoofer’s volume for extra low-level impact and increase the bass extension, but you’ll do so at the expense of the soundbar’s tonal balance. The Death Star’s first firing test on Jedha, for example, couldn’t reproduce the low-level impact I’ve experienced with a sub as part of the mix. And, when I increased the Yamaha’s internal sub’s volume or engaged the bass extension feature, the YAS-107 became far too muddy for my taste. Yamaha has done it again. The YAS-107 is a worthy successor to it’s predecessor. The YAS-107 stands as an outstanding sonic performer. 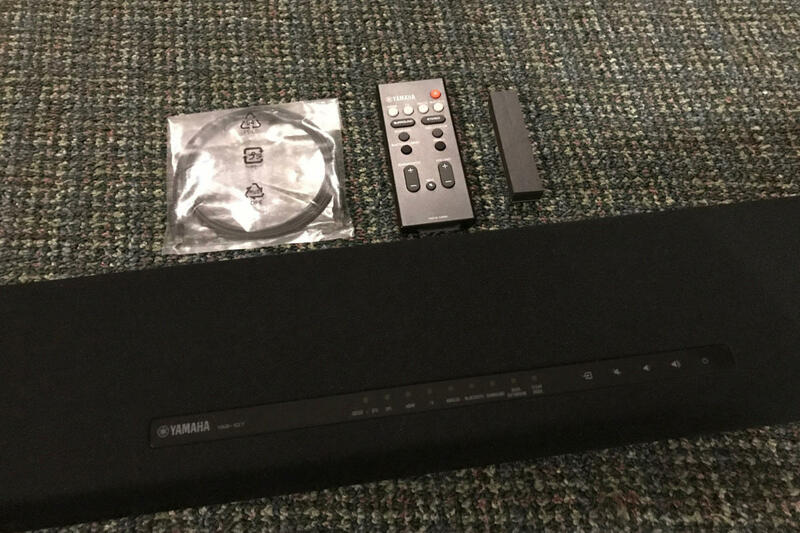 Whether you’re looking for a soundbar solely for the purpose of improving dialog or one that will give you a great cinematic experience, you simply cannot go wrong with Yamaha’s YAS-107. Highly recommended.